Tildrakizumab (tildrakizumab-asmn in the USA) [Ilumetri®; Ilumya™] is a humanized monoclonal antibody (mAb) that selectively targets the p19 subunit of interleukin (IL)-23, thereby inhibiting the IL-23/IL-17 axis, the signalling pathway primarily implicated in the immunopathogenesis of psoriasis. Administered subcutaneously, it is approved for the treatment of adults with moderate-to-severe plaque psoriasis who are candidates for systemic therapy (e.g. in the EU and Australia) and those who are candidates for systemic therapy or phototherapy (in the USA). 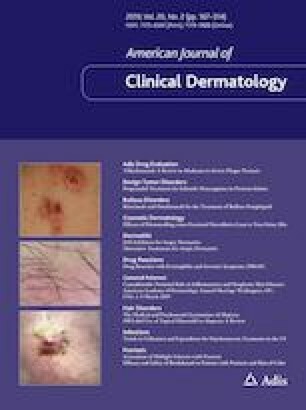 In the pivotal phase III reSURFACE 1 and 2 trials, tildrakizumab was superior to placebo and efficacious compared with etanercept, in terms of the proportion of patients achieving a response [≥ 75% improvement from baseline in Psoriasis Area and Severity index score (PASI 75) and a Physician’s Global Assessment score of 0/1] at week 12. Response rates peaked at week 22 and the vast majority of patients achieving PASI 75 at week 28 maintained this response after a total of 3 years of treatment in the reSURFACE trials and their ongoing open-label extension studies. In addition, patients with a partial or no response to etanercept at week 28 benefitted from switching to the highest approved dose of tildrakizumab in the reSURFACE 2 trial and its ongoing extension. Treatment with tildrakizumab improved health-related quality of life and was generally well tolerated, both in the short- and longer-term. Tildrakizumab thus expands the range of useful therapeutic options for patients with moderate-to-severe plaque psoriasis, particularly those with an inadequate response to phototherapy and conventional systemic agents. The manuscript was reviewed by:KM Beck, Department of Dermatology, University of California San Francisco, San Francisco, CA, USA, SK Dubey, Department of Pharmacy, Birla Institute of Technology & Science (BITS), Pilani, Rajasthan, India; M. Galluzzo, Department of Dermatology, University of Rome ‘Tor Vergata’, Rome, Italy; MJ Gooderham Department of Medicine, Queen’s University, Kingston, ON, Canada, L Puig, Department of Dermatology, Hospital de la Santa Creu i Sant Pau, Universitat Autònoma de Barcelona, Barcelona, Spain. During the peer review process, the manufacturer of tildrakizumab was also offered an opportunity to review this article. Changes resulting from comments received were made on the basis of scientific and editorial merit. James Frampton is a salaried employee of Adis/Springer, is responsible for the article content and declares no relevant conflicts of interest. National Institute for Health and Care Excellence (NICE). Psoriasis: assessment and management. 2012. https://www.nice.org.uk. Accessed 16 Jan 2019. European Medicines Agency. IlumetriTM (tildrakizumab): EU summary of product characteristics. 2018. https://www.ema.europa.eu. Accessed 15 Oct 2018. Sun Pharma ANZ Pty Ltd. Ilumya™ (tildrakizumab): Australian product information. 2018. https://www.ebs.tga.gov.au. Accessed 19 Feb 2019. Sun Pharmaceutical Industries Inc. Ilumya™ (Tildrakizumab-asmn) US prescribing information. 2018. https://www.accessdata.fda.gov. Accessed 15 Oct 2018. European Medicines Agency. Assessment report. Ilumetri. International non-proprietary name: tildrakizumab. Procedure no. EMEA/H/C/004514/0000. 2018. https://www.ema.europa.eu. Accessed 12 Dec 2018. European Medicines Agency. Tremfya 100 mg solution for injection: EU summary of product characteristics. 2017. https://www.ema.europa.eu. Accessed 19 Feb 2019. European Medicines Agency. Cosentyx 150 mg powder for solution for injection: EU summary of product characteristics. 2015. https://www.ema.europa.eu. Accessed 19 Feb 2019. European Medicines Agency. Taltz 80 mg solution for injection: EU summary of product characteristics. 2016. https://www.ema.europa.eu. Accessed 19 Feb 2019. European Medicines Agency. Kyntheum 210 mg solution for injection: EU summary of product characteristics. 2017. https://www.ema.europa.eu. Accessed 19 Feb 2019. European Medicines Agency. STELARA 45 and 90 mg solution for injection: EU summary of product characteristics. 2019. https://ec.europa.eu/health/documents/community-register/2009/2009011653548/anx_53548_en.pdf. Accessed 19 Feb 2019. Abbvie. AbbVie receives CHMP positive opinion for risankizumab (SKYRIZI™) for the treatment of moderate to severe plaque psoriasis [media release]. https://news.abbvie.com. Accessed 28 Feb 2019. European Medicines Agency. Tremfya (guselkumab): EU assessment report. 2017. http://www.ema.europa.eu. Accessed 23 Jan 2018. National Institute for Health and Care Excellence (NICE). Tildrakizumab for treating moderate to severe plaque psoriasis [ID1060]. 2019. https://www.nice.org.uk. Accessed 19 Mar 2019. National Institute for Health and Care Excellence (NICE). Guselkumab for treating moderate to severe plaque psoriasis. 2018. https://www.nice.org.uk. Accessed 23 Jan 2019.